As most of our customers were aware last year, the key to a successful home sale was heavily determined by perceived market value. This meant that, pretty much across all agents and regions, asking prices had to be very realistic. Nevertheless, there were still plenty buyers around, but nearly all wanted to see demonstrable good value before committing to a purchase. The level of sales activity in our region was actually quite buoyant and, we at Homes Estate Agents, successfully completed over 600 property moves locally in 2018. However, there’s no doubt that the underlying sentiment of ‘value’ continues and we expect this to be the main feature of the market ongoing. At the time of writing, the outcome of the Brexit saga is yet to be determined. If the UK manages to re-negotiate a deal, which Parliament can accept, then we fully expect levels of confidence to return quite quickly and this will generate a positive influence on the property market. However, this remains to be played out. 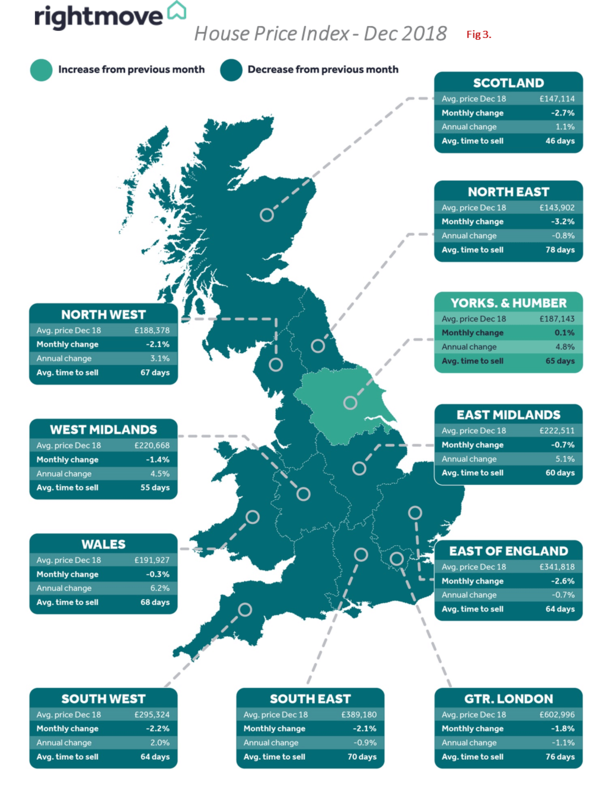 In the same report, Rightmove’s analysis of asking prices (Fig. 1) shows a year of two different halves, rising steadily in the first 6 months and falling sharply in the second. Prices in December were nearly £10,000 less than they were in October. However, they do report that buyers are being tempted, with the number of sales agreed proving surprisingly resilient. Volumes of sales are only 2% lower than they were 12 months ago, in what was then considered a more buoyant market. Since the recovery from the financial crash in 2008, we have become accustomed to seeing healthy annual growth in sale prices. Not so however in 2018 according to the latest analysis from the Nationwide. 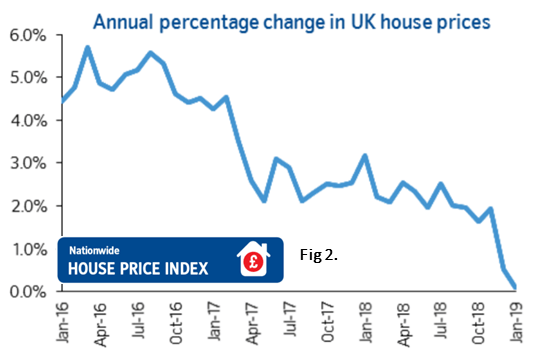 In their Price Index report, published in February 2019, we can see annual house price growth of 4.5% to 5.5% from 2016 to 2017. 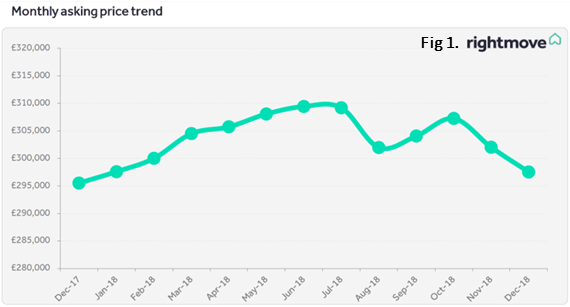 This then fell to just over 2% in 2017, continuing to mid-2018, when it rapidly fell to virtually zero in January 2019. (Fig 2). Price growth expectations for this year range from zero to 2% with most pundits forecasting around 1 % maximum.